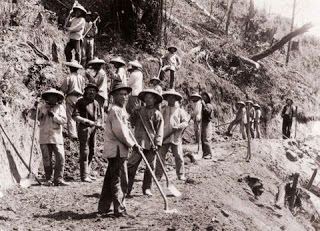 Does anyone have any information about the Chinese railroad workers in the unknown image shown below? Source, photographer, railroad, location, date, etc. ???? That was on the Loma Prieta Branch of Southern Pacific in the early 1880's. The Pajaro Valley Historical Society, in Watsonville, California has a similar Loma Prieta Branch view with Chinese, and may have others, including your view.